We are the ‘blue door with the blue awning’ entrance on State St.
We are a gathering place for older adults who are young at heart! Welcome! To provide older adults opportunities for continued independence to maintain an active, productive, and dignified life. 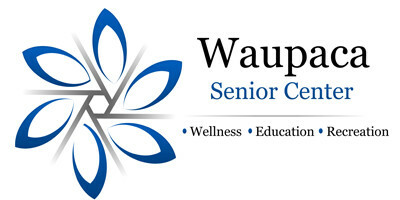 Our vision is to be an indispensable asset to seniors and the Waupaca community. *A high quality of life for seniors, and believes that Center experiences contribute to that goal. *Community, and prioritizes effective partnerships with various community entities. *We believe these partnerships result in experiences that enhances both seniors and community. *Staff. Provision of a well-qualified, motivated staff is imperative for ensuring that the Center fulfills its mission. Excellence, by being the provider of choice for seniors in enrichment and social experiences. There is a $15 membership fee per year for residents of the city of Waupaca and the townships of Farmington and Dayton. All other townships, such as Lind or Waupaca, and out of city residents is $20. Memberships are available at the SC office. Ages 55+. 6. Membership assures you belong to a very valuable asset and organization in Waupaca where you have the opportunities for fun, socialization, education, health, fitness & food. 7. Members get an awesome membership card!